A violin virtuoso playing fiery Slavic and gypsy melodies and a torchy jazz singer performing her own songs will join in concert to open the 24th season of Music at the Grazhda on Sunday, July 2, at 7 p.m., at Grazhda Hall, Ukraine Road (off Rt. 23A), Jewett, NY. Vasyl Popadiuk is a classically trained violinist from Ukraine, now living in Toronto and performing internationally for enthusiastic and admiring audiences. In addition to appearing as a violin soloist, Popadiuk has been the dynamic lead player in the ensemble PAPA DUKE, a group that plays a fusion of Eastern European melodies in an energetic style mixing classic pop, rock, and jazz. 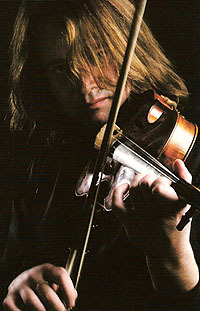 It is this unique musical persona that the violinist will bring to the concert on the mountaintop. Joining Popadiuk on July 2 will be Marianna Vynnytsky, a soulful singer who composes her own songs. Ukrainian-born Marianna completed her musical studies at the Kyiv Conservatory and performed in several well-known ensembles in Kyiv. She made her New York debut in 1995, singing the jazz compositions of Myroslav Skoryk and later touring the United States and Canada with this repertoire. In the upcoming concert with Popadiuk, Marianna will sing some of her own songs, including "Autumn," "Island of Love," and "Melting Snow." The opening concert of this season is a departure from the traditional classical music that has been offered by Music at the Grazhda, the series sponsored by the Music and Art Center of Greene County and founded by Ihor and Natalia Sonevytsky in 1983. The current musical director, Volodymyr Vynnytsky, said that he was excited when his long-time friend and phenomenal violinist Vasyl Popadiuk agreed to perform in the series this summer, and he decided that Popadiuk's dynamic presence would be an exciting opening act. The schedule of performers for the rest of the summer once again includes brilliant classical musicians and chamber groups whose performances will bring great pleasure to concert audiences.